Can you provide a sample-project? + required full log of mvn clean fx:native. Seems like this is problem related to Maven configuration. We get it, but this is don't cause your error. Just for being curious: do you execute the generated ´´´.jar´´´ or the generated ´´´-jfx.jar´´´ ? As far as i can see, this is no bug of javafx-maven-plugin. Please reopen this issue with more details, I will close this as invalid until then. @FibreFoX @maxd: I think, I have a similar / the same issue with the native launcher on Ubuntu 12.04. I am running Java(TM) SE Runtime Environment (build 1.8.0_60-b27) on Ubuntu 12.04.5. javafx-maven-plugin is at 8.1.4. The Maven logfile is at https://gist.github.com/stelfrich/039c491a4ef02bd8739a#file-maven-log. The POM at https://gist.github.com/stelfrich/c9a0160781b73a30d3fd#file-pom-xml. @stelfrich Do you have the possability to create a small project, where we can check this? I would create a dedicated VM with ubuntu to analyse this. @stelfrich Which OS are you running? 32bit or 64bit? I am facing the same problems since quite a while: "No main class specified". The app is also launching via "java -jar" and I can see the Main-Class entry in META-INF/MANIFEST.MF points to the right Class (Main-Class: de.jensd.mqttfx.ui.Run) (Ubuntu 14.04 32Bit and 64Bit). Did you try this with a previous version of java (loke 1.8.0-25 or 1.8.0-40)? Maybe it's something they've changed in their native launcher. @stelfrich thanks a lot, just to make sure: have you checked, if that project still contains that bug? @FibreFoX: In my current configuration. The error persists. I have a meeting now and will check an older JDK (1.8.0u40) afterwards.. I think it happened since the change from 1.8.0u20 to 1.8.0u40. I can confirm @Jerady's observation. With 1.8.0u20, 1.8.0u25, and 1.8.0u31 the MWE works fine. The main class is not found (see #124 (comment)) starting with 1.8.0u40..
any new insights so far? Sure! I was just curious if there is any progress ;-). Clearly you have to take your time! I very much appreciate your efforts, thanks a lot! Should be not as hard to check this :) I will report as soon as I find something new here, and if so, I will be report this to the JavaFX-team. Maybe it's related to this?! I can confirm the wrong behaviour running Ubuntu 14.04 LTS with oracle-java 1.8.0_60-b27 running in 64bit (within Virtualbox 5.0). @FibreFoX: Thanks for the quick fix! I can confirm, that the SNAPSHOT version fixes the problem, although I don't completely understand why: the name of the generated config is in my case vizardous-1.2.cfg..
Again: thanks a lot for your effort! I am working on this and will release a new version today, so if everything works, you should be able to use the new 8.1.5-release tonight/tomorrow. Still have to do some work on disabling this feature, and creating a new IT-project for linux-systems only. New version got released on sonatype, it's just a matter of hours to be propagated to maven-central (as always/normal). I bet they will reject it with the "openjdk" hint! Has anyone tried creating a .deb bundle using the OpenJDK? I stumbled upon this thread, as I have the exact same error: (No main class specified, Failed to launch JVM). But I only experience this error with the OpenJDK (8u66). With Oracle JDK (8u60) everything works like a charm. Also execution via java -jar ... is not a problem in either case. To be honest I don't use this javafx-maven-plugin (yet 😉), thus I don't want you to reopen this issue, but maybe someone can give me a hint on whats wrong. In both cases (Oracle and OpenJDK) my .cfg file as well as the binary do not contain any ".". The directory structure is the same for both JDKs. But the binary and the cfg-file (as well as the embedded JVM, obviously) differ. Any hint is appreciated, as I want to switch from embedding the Oracle JVM to the OpenJDK for legal reasons as well easier distribution. Hi @totalvoidness, just to be clear: I just can check such issues when application was bundled via javafx-maven-plugin. Support for normal ANT-version has to come from Oracle themselves or could be found at some places. The issues here should only be on topic of javafx-maven-plugin. 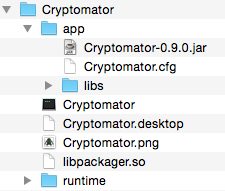 But back to your question/problem: have you checked inside Cryptomator.cfg if the referenced JAR is the right one? For better debugging you should try to create a project, where this kind of issue can be reproduced. @FibreFoX I'm currently testing this. But have to do a dist-upgrade first, as ubuntu utopic isn't supported any more. As far as I can tell now: Oracle JDK 8u45, which is the last version for utopic in webupd8 ppa, does not work neither with nor without the skipNativeLauncherWorkaround124. But I think thats ok, as any native package will most likely contain the latest JDK anyway. I'll report about Oracle 8u66 as well as OpenJDK as soon as my VM is up-to-date.